Downtown Living at it's Best! 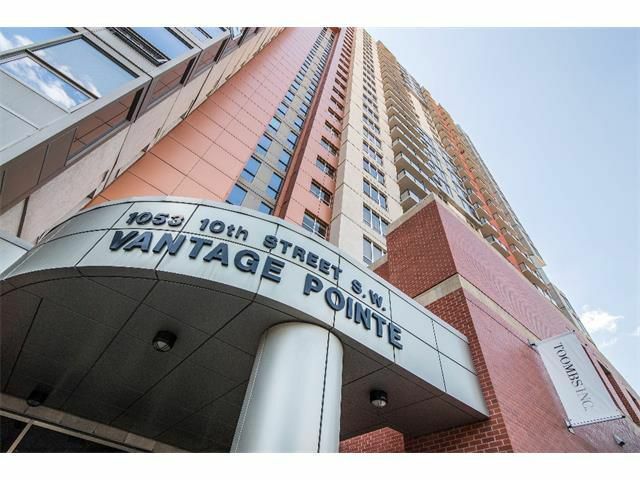 Vantage Pointe is a Pet friendly and ideally located LUXURY Condo tower steps from DOWNTOWN office towers & the LRT, UPTOWN dining, shopping, cafes & walking distance to 17th ave nightlife. River paths & parks so close you'll go anytime. Grocery shopping @ Co-op Midtown Market adjoining the property. This EAST facing unit is coveted for it's abundance of windows and UNOBSTRUCTED DOWNTOWN VIEWS. One Bedroom, open concept kitchen & living area with upgraded carpet. Ceramic tile in the bathroom and front entrance, 9' ceilings, in-suite laundry, balcony + gas BBQ hookup. Underground heated parking, visitor parking & convenient bike room. FIRST-CLASS building amenities include a fitness gym, steam room/sauna. PT on-site security, secure key fob access and security cameras! Condo fees are only $261 and even include ELECTRICITY!! (All furniture can even be included) Enjoy living in the heart of it all! Call for your private showing or call your favourite Realtor to view!